Blom, Suzanne Allés. 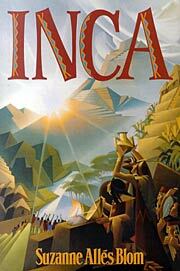 Inca: The Scarlet Fringe . Tor/Forge 2000. What if: The Inca empire was not in the midst of civil war when Pizarro launched his invasion. Comments: This was apparently the first of a trilogy. The author posted on Usenet in April 2005 that the second and third books were written and seeking a publisher. But following her death in 2012, it seems unlikely they will be published. Published: Tor/Forge 2000 (0312874340BUY); Tor 2001 (081257883XBUY).